Belmont University recently held its third annual Diversity Week, an opportunity for faculty, staff and students to engage in a celebration of the University’s diversity and learn more about its campus-wide diversity and inclusion efforts, The Belmont State of Mind. Launched two years ago as a way for Belmont community members to engage in important dialogue and participate in meaningful experiences, this year’s celebration included more than 20 events planned by Belmont’s Welcome Home Diversity Council, students groups and more. Director of the Office of Multicultural Learning and Experiences & Bridges to Belmont Dr. Mary Clark presents at The Belmont State of Mind convocation. The week began with a presentation by the University’s interdisciplinary Welcome Home Diversity Council, a team of faculty, staff and students that advise on and oversee campus diversity and inclusion efforts. This discussion highlighted and detailed The Belmont State of Mind, Belmont’s newest, over-arching campus-wide diversity and inclusion initiative. Monday evening featured the Corners of Campus Student Panel, hosted by Belmont’s Black Student Association, where a panel of student leaders discussed their experiences on campus as individuals and as members and representatives of their organizations. Conversation included opportunities for panel members to reflect on their experiences across campus. Students leaders from across campus share their perspectives. Tuesday evening’s Privilege Walk: Walking Toward Awareness, Equality and Action, was held in the Curb Event Center and provided a meaningful opportunity for students, faculty and staff to engage in dialogue surrounding privilege, individually and as a group. Outside facilitators and community leaders Lindsey Krink and Rhiana Anthony guided participants through a silent activity that cultivated awareness and highlighted critical self-reflection. Participants line up in the Curb Event Center, ready to walk toward awareness, equality and action. Diversity Week also included Real Talk sessions for students, faculty and staff–a campus favorite. These sessions, facilitated by Telecommunications Manager and Welcome Home Diversity Council Member Gary Hunter, provide a space for all members of the Belmont community to engage in honest conversations surrounding topics related to diversity and inclusion. This year’s faculty and staff Real Talk was the largest session Belmont has held. The University’s Chinese Cultural Club hosted the Chinese Moon Festival Celebration on Wednesday, October 4 in honor of the second largest cultural celebration in China. 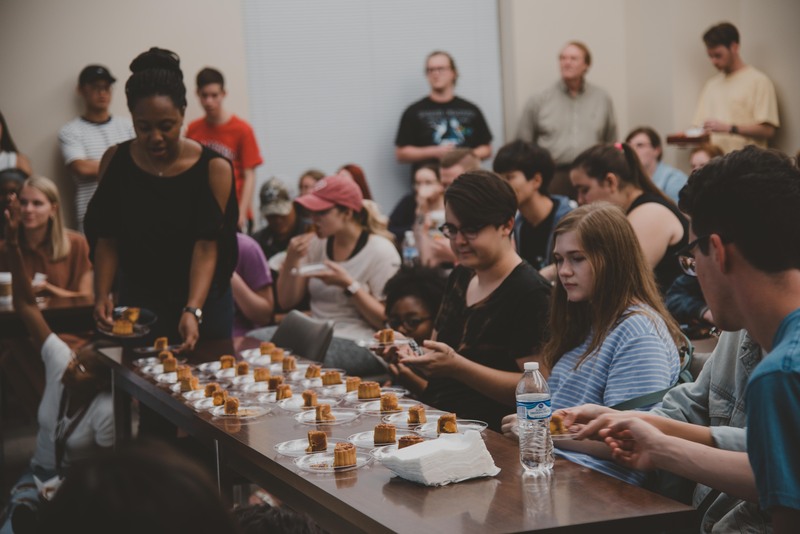 The event featured a presentation by the Chinese Cultural Club’s Vice President, detailed descriptions of the historical significance of the event and a sampling of moon cakes, the traditional treat served at these festivals. More than 100 students, faculty and staff attended the celebration. Students enjoy moon cakes at the Chinese Moon Festival celebration. The remainder of the week included a panel discussion and screening of the newly released film, “Marshall,” a discussion on the intersectionality between Christian faith and hospitality, a presentation highlighting the history of Aztec dance and the Stone Soup Cook-Off where faculty and staff celebrated the end of the week together, tasting dishes that honored each other’s heritage. Created after the Stone Soup parable, this event emphasized the ways diverse community members bring unique aspects of themselves to the larger community, creating a richer and more valuable experience for all. The week also included an ongoing art project where faculty, staff and students were encouraged to create an “identi-tree” that highlighted their unique identity and was hung in the “Belmont forest.” Completed trees were on display in the Beaman Student Life Center throughout the week. Additionally, more than 100 opportunities to serve diverse populations in the Nashville area were provided through Diversity Week’s Side by Side Service Initiative. For more information on Diversity Week, The Belmont State of Mind or the Welcome Home Diversity Council, click here.